The Holy Fathers say (this is how Fr. Cleopa began to express concisely his spiritual experience to us, inherited from the Holy Fathers and personally experienced by him, as every one of his words clearly confirms) that on the path of salvation one is tempted by the devil from eight sides: from the front, from behind, from the left, from the right, from above, from below, from inside, and from the outside. 1. One is tempted from behind when one continuously remembers the sins and evil deeds one has committed in the past, recalling them anew in one’s mind, reshuffling them, engaging them, despairing because of them, and contemplating them sensually. Such a remembrance of how we have sinned in the past is a demonic temptation. 2. One is normally tempted from the front through fear at the thought of what the future holds: of what will happen to us or to the world; of how much longer we will live; of whether we will have anything to eat; of whether there will be a war or any other kind of serious and frightful event to come; and, in general, by making all kinds of guesses, predictions, prophecies, and everything else that induces fear of the future in us. 3. One is tempted by the devil from the left through the call to commit obvious sins and to behave and act in ways that are known to be sinful and evil, but which people do nonetheless. This temptation is a direct call to sin openly and consciously. 4. There are two ways in which the devil tempts from the right. The first is when one performs good deeds and actions, but with a bad or malicious intent and purpose. For example, if one does good or acts well out of vainglory, to receive praise, to obtain a position, to acquire fame, or in order to attain some benefit for oneself – it follows that one is doing such good out of vanity, avarice, and greed. The performance of good deeds for bad purposes is sinful and vain. The Holy Fathers liken such a performance of good deeds (such as fasting and almsgiving) to a body without a soul, inasmuch as the purpose for which a deed is accomplished is its soul, while the deed itself is its body. Therefore, the performance of good deeds with an ungodly purpose is essentially a temptation coming from the right, that is, coming under the guise of good. The second demonic temptation from the right comes through various apparitions and visions, when one receives visions of the devil in the form of God or an Angel of God. The Holy Fathers call trusting these specters from the devil, or accepting these demonic phenomena, delusion or deception [prelest]. 5. Further, the devil tempts one from below when one is capable of performing good deeds or holy virtues but is too lazy to do so; or when one knows that one should make greater efforts and labors in ascetic struggles (in virtues and good deeds), and is capable of doing so, but does not do so out of laziness or because one is looking for excuses for one’s laziness. One thereby spiritually rejects these virtues by doing much less than one could in fact do. 6. Temptations from above (Elder Cleopa, in order better to explain this to us, demonstrated with his hands the direction from which one or another temptation came; he then briefly repeated what the direction of the temptation he had just described was) also come about in two ways. The first is when one takes upon oneself ascetic struggles that exceed one’s strength, thereby recklessly straining oneself. This happens, for instance, when one is sick but imposes a fast on oneself that is beyond one’s strength; or generally when one overdoes any ascetic struggle that is beyond one’s spiritual and physical capacity. Such obstinacy lacks humility and is unreasonably presumptuous. Another temptation from above is when one strives to learn the mysteries of Holy Scripture (and of God’s mysteries in general), but does not do so according to one’s spiritual maturity. That is, when one wants to penetrate the mysteries of God in Holy Scripture (or in the saints, the world, and life in general) in order later to explain and teach these mysteries to other people when one is not spiritually mature enough to do so. The Holy Fathers say that such a person wants to chew through a bone with baby teeth. St. Gregory of Nyssa speaks about this in his work, The Life of Moses. He says that it was for this reason that God commanded the Israelites, who were imperfect, to eat only the meat (which is like milk for the teeth) from the Passover lamb – and, moreover, with bitter herbs – and not to break into pieces or to eat the bones, but rather to burn them in fire (cf. Exodus 12: 8, 10, 46). This means that we, too, should interpret only those mysteries in Holy Scripture (and in our faith in God generally) that correspond to our spiritual maturity and to eat (absorb) them with bitter herbs, that is, with everything that life brings us (suffering, grief); we should not bite into the mysteries of Holy Scripture, Divine knowledge, and God’s Providence, like so many hard bones, with our baby teeth; they are susceptible to fire only, that is, they become clear only in ripe spiritual maturity and in experienced souls that have been tested by grace-filled Divine fire. 7. One is tempted from within by that which one has in one’s heart and by that which proceeds from the heart. The Lord Jesus Christ clearly stated that it is from within, from one’s heart, that sinful and impure thoughts, desires, and lusts proceed (cf. Matthew 15:19) and tempt one. Temptations come not only from the devil, but also humanly, from the evil intentions and skills, lusts, evil desires, and inner love of sin that proceed from an unclean heart. 8. Finally, the eighth door to demonic temptation is opened from the outside, through external things and occasions, that is, through everything that enters from outside through one’s senses, which are the soul’s windows. These external things are not evil in and of themselves, but by means of them one’s feelings can be tempted and induced to evil and sin. These, then, are the eight means by which everyone is tempted, regardless of whether one is in the world or in seclusion. The theme of the 2017 residential conference will be Mount Athos and Russia, complementing the celebrations of 1000 years of Russian monastic presence on the Holy Mountain that have been taking place during the course of this summer. The first mention of a Russian monastery on the Holy Mountain was in 1016, and a series of events have occurred already this year to mark this millennium. As the Chairman, Dr Graham Speake, has written: “Some of the most celebrated names in the history of Russian spirituality have been Athonites. Russians have contributed generously to the spiritual and cultural traditions of the Holy Mountain, just as Greek Athonites continue to have a significant impact on the spiritual life of the Russian Orthodox Church”. The conference will bring together a distinguished group of speakers from Russia, the Ukraine, Finland and the United Kingdom, to explore various aspects of the Russian associations with Mount Athos. A historical perspective will be provided by Sergey Viktorovich Shumilo, from the Ukraine. He will talk about the early Russian presence on the Holy Mountain, and the life of St Anthony, founder (with Saint Theodosius ) of the Caves of Kiev. Hieromonk Irinei (Pikovskiy) , from the Sretensky Monastery in Moscow will examine how recent Athonite elders have influenced contemporary spiritual life in Russia, and inspired a renewal of Russian pilgrimage to the Holy Mountain. Professor Rene Gothoni, from the University of Helsinki, will look at the history of Russian pilgrimage to Athos since the 12th century, and Archpriest Professor Andrew Louth will talk about the way in which the short 19th century Russian story, “The Way of a Pilgrim” was influential in promoting the use of the Jesus prayer, and the reading of the Philokalia. The President, Metropolitan Kallistos Ware, will open the Conference by looking at the life of Saint Nil Sorsky, who spent time on Athos in the 15th century before returning to Russia to revive monastic life in the Athonite tradition. Hieromonk Nikolai (Sakharov) will concentrate on the 20th century Russian Saint Silouan, and his disciple and biographer, Father Sophrony. 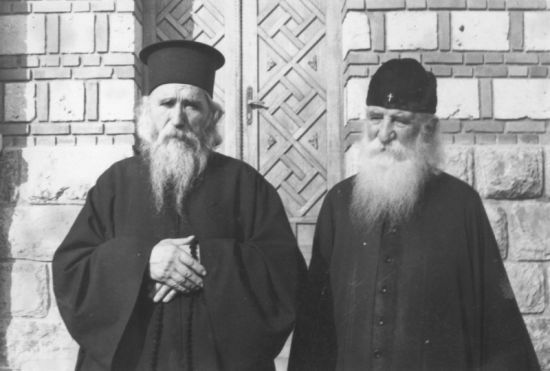 Dr Nicholas Fennell will consider the influence of Archimandrite Misail (Abbot of the Holy Monastery of Saint Panteleimon from 1905 to 1940) and the Monastery’s subsequent development.